I have been asked to research the history of our pipe organ. I was chosen because I was living in Cañon City and a member of this church at the time the organ was purchased and installed. I wish to elaborate a little on where the organ came from. In the mid 1920's Silent Movies were produced, stage theaters were converted and new theaters were built to accommodate the new type of entertainment. Organs installed and used to follow the sequences and moods of the show on film. In the early 1930's sound tracts were perfected to add voice, music and sound on the film with the picture, therefore organs were no longer needed. They were from the theaters and sold for a fraction of the cost. This organ was originally installed in the Santa Fe Theater in Denver on the 25th day of September 1927, at a cost of $7,000.00. Our church was able to purchase it at a cost of $2,500.00. With a considerable amount of sacrifice both money wise and exertion, the organ was paid for and installed in the month of May, 1934. This organ is listed as a three manual theater organ. It was manufactured by the Moller Pipe Organ Co. of Hagerstown, Maryland. The three organs are #1 solo organ, #2 great organ and #3 orchestral organ incorporated into one unit. It has 754 pipes, 1619 notes, 20 chimes, a bass drum, snare drum, cymbals, triangle, tom tom, bird whistle, siren, doorbell, and an auto horn. Many of these accessories will never be used in a church service, however they do work. The church had the services of a professional organ installer. His name was Lon Minier and his crew. 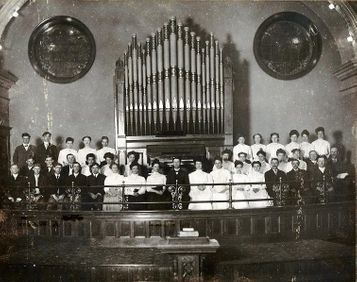 "As early as 1915 members of the church had begun to discuss the need for a new organ. During Reverend Konkel's Pastorate this effort finally reached fruition. An organ contract committee of three was formed to secure a new organ for the church. 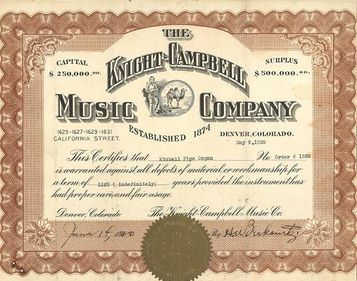 A Kimball Pipe Organ was purchased through the Knight Campbell Mucis Company of Denver for $6,300.00 plus freight charges of $246.88. This contract was signed June 14, 1920. The organ carried a guarantee stating: "This certifies that Kimball Pipe Organ No. order #1530 is warranted against all defects of material and workmanship for a term of Life (indefinitely) years providing the instrument has had proper care and fair usage." The new pipe organ at the Methodist church has been installed and is now completely ready for use. The opening recital will be given Sept. 8 by Prof. Shad J. Tinsley, organist from the Trinity Methodist church in Denver, he having had 24 years experience. Tickets for the recital will be 50 cents. The new organ has everything on it in the way of stops and tones to give you the very best and most variety of good music possible." 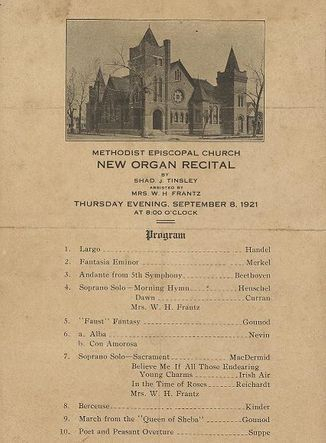 The organ was used between about 1908 to September 1921.